The Chairman of the Department of Electrical Engineering at the University of Technology, Assist. 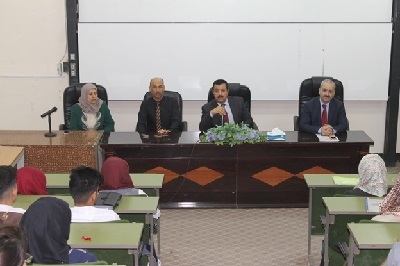 Prof. Dr. Dari Yousif Mahmoud Tolba, met the first new students admitted to the Department for the 2017-2018 academic year for the morning study in the presence of the meeting of the administrative assistant of the department. Assist. Prof. Dr Kanaan Ali and the Head of the Educational Guidance Unit Assist. Prof. Dr. Sandas Damad and the Director of the Registration Division. At the beginning of the meeting, he welcomed them and wished them a successful academic life to be true students and builders capable of assuming the responsibility entrusted to them to serve our dear country. Which represents the stage of building and character formation, in which the character of the student is refined in accordance with the nature of the engineering study. The students were briefed on the set of laws, regulations and university instructions concerning the discipline of students and uniform, the relationship of the student with the educational institution in which he is studying, his colleagues and his teachers, as well as the distribution of a profile containing the profile of the department, vision, mission and objectives of the department.